The look of distinction that pavers, stonescapes and outdoor structures add to any landscape is undeniable. "Cast in stone" creates a sense of permanence and elegant refinement to any property. When designed with vision and architectural flair, hardscapes create sturdy and effective functionality while aesthetically expanding the architecture of your home into the outdoor environment. 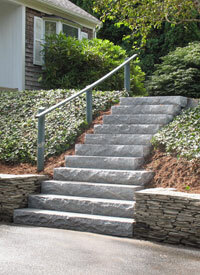 Cape Cod hardscapes and landscapes by M. L. Enterprises are always an expression of our excellence. Our certified craftsmen use equipment, materials and processes that stand up to Cape Cod freezing and thawing cycles. Each hardscape is a unique design, using color, texture and dimension to bring one-of-a-kind elegance to the finished project. Our client is our partner. As our clients prospers, so do we. We welcome your questions and comments.